We love weddings of the rich and famous, don’t we? And we always want to know what goes on behind the scenes. It’s this voyeurism that makes Made In Heaven, Amazon Prime’s latest series, completely relatable. If you’ve attended weddings in south Delhi, the posh, snooty, and exceedingly rich part of India’s capital, you know what we’re talking about. The show makes its intentions clear from the first episode. It’s going to scream luxury at you. And that’s great. That’s what Chhattarpur and Jor Bagh are about, aren’t they? 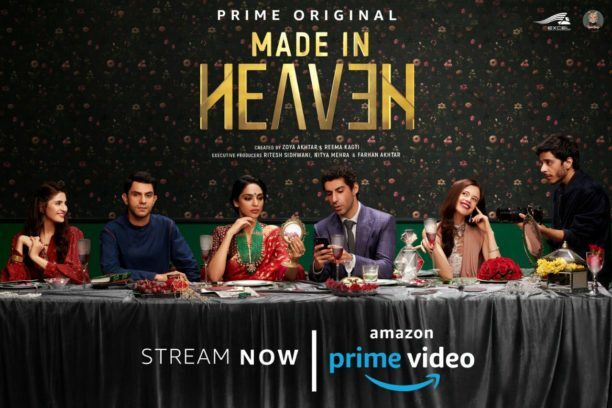 Made In Heaven follows the lives of Tara Khanna and Karan Mehra, wedding planners who get far too involved with clients and have massive complications in their own personal lives. Tara, a middle class girl married into a farmhouse-owning business family of Delhi, is trying to make it on her own. Karan is trying hard to get out of financial problems and recover from a previous business failure. The show is great for the first four to five episodes. The weddings are entertaining and disturbing at the same time. You will want to binge watch the series till you get to this point. The sixth episode is a deviation from the main plot of the show and goes into serious, uncharted territory. While this episode is well done and seems somewhat necessary, the makers of Made In Heaven try too hard to insert a social issue into every single episode after this one. Eventually, it seems that they wanted to follow a format of one wedding = one issue for every episode. That doesn’t mean it stops being entertaining. The stories just become Bollywood-esque and slightly simplistic in the second half of the series. The main characters are well-written. No one is black and white, you can’t simply hate them or love them. There is something hateful and something likeable about most of them. Kalki Koechlin’s character is one such example. You’ll love her, you’ll hate her, you’ll feel bad for her, and you’ll hate her again. Jim Sarbh’s character is mostly predictable but there are glimpses of unexpected normalcy here and there. But the one who really takes it away, especially for middle class people like most of us, is Jaspreet aka Jazz. She makes terrible mistakes but also comes up with the best jugaad when her team is in trouble. Her glee at walking into a huge hotel room, her disappointment at returning to her normal life after that, and her absolute awe at the grandeur of these weddings is quite endearing. Something we didn’t need in a series like this was the commentary at the end of each episode. The message in each episode was pretty clear. To have it repeated again from the videographer’s point of view seemed like a waste. Pros: Great entertainment, captures Delhi weddings and all the drama really well, great insight into the lives of the super rich, well-written characters, several unexpected twists. Cons: Tries to tackle too many issues at once, stories become simplistic in the second half of the series. Watch Made In Heaven this weekend. You’ll want to binge watch it, so it’s possible that you may finish the show in a single sitting. Like us, you too will want to see a second season. PS: Din Shagna Da is DONE! Let’s get over it now.